THE HOCKEY SCHTICK: Was Nashville's flood caused by global warming? Above graph from the US Climate Extremes Index shows the sum of the percentage of the United States with a much greater than normal number of days with precipitation plus the percentage with a much greater than normal number of days without precipitation. Five year mean is shown in green. 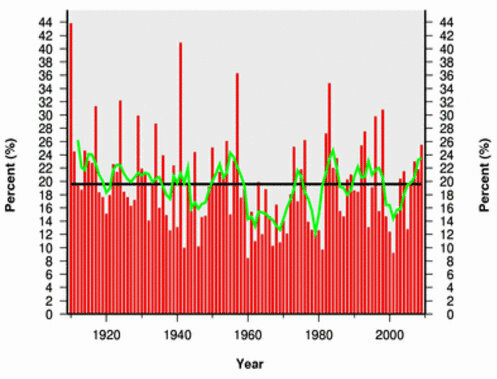 Climate scientists frequently like to have it both ways, claiming that anthropogenic global warming causes both increased precipitation and increased droughts. Did anthropogenic global warming also cause the highest recorded flood in Nashville in 1926 & 1927 according to the US Army Corps of Engineers? And severe Nashville flooding in 1937, 1975, and 1977? UPDATE 2: The flood peak on the Cumberland River in downtown Nashville ranks as only the tenth highest in more than 200 years of record at that site. The run off is caused by more and more cement cover more and more earth. Rain can NOT percolate so it runs the contours and creates rivers that flood during heavy downpours. Days with precip. is not the relevant metric. 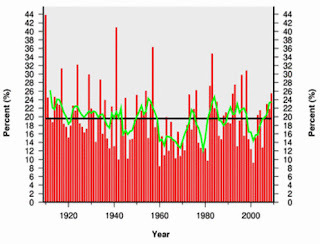 It is that the heaviest precipitation events have become more extreme. See the USGCRP report, which covers this. Here we go again! You can’t blame a flooding event on Global Warming! If you people understood Meteorology you would understand why the flooding in Nashville actually happened. This was a textbook setup for flooding. This was a setup were you have a LOT of atmospheric forcing or lift. A low level jet played a big role because it transports humidity from the Gulf and it just feeds it into thunderstorms. In the case of Nashville this was a setup in Meteorology called “training”. Meaning, just like a train, heavy rain and thunderstorms track over the same areas over and over leading to flooding. You need more than just warm air to create this type of event. When you have temperatures in the 30’s on one side of the storm and in the 70’s on the other, this is can create a really good setup for a strong storm system. The most significant point being made by the fakes is that water vapor multiplies global warming by a factor of 3 or more, because warmer air holds more water vapor. The logic is fraud. The air would always be saturated if an increase in holding capacity resulted in an increase in humidity. Dry air and droughts result from cold oceans not putting as much water vapor into the air—hot air and shortage of water vapor. The volume of water vapor is about 4% in very humid and warm tropical air. Water vapor CAN NOT BE GREATER than 4%!! Because temperature sets a limit to how much water vapor can be in the air. So to blame this, and other, events on AGW is just fraud!